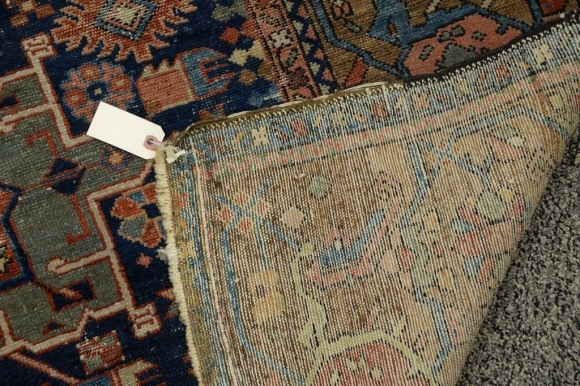 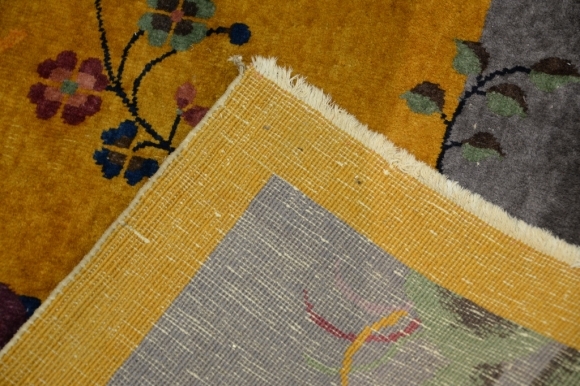 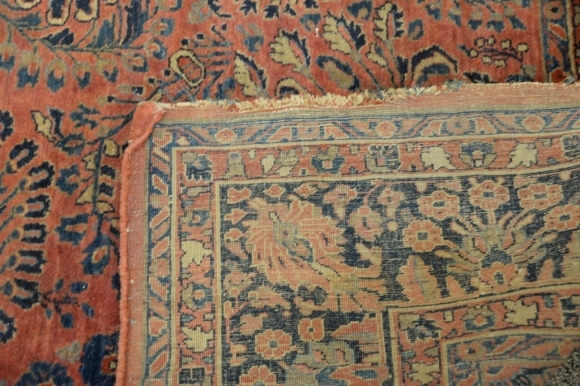 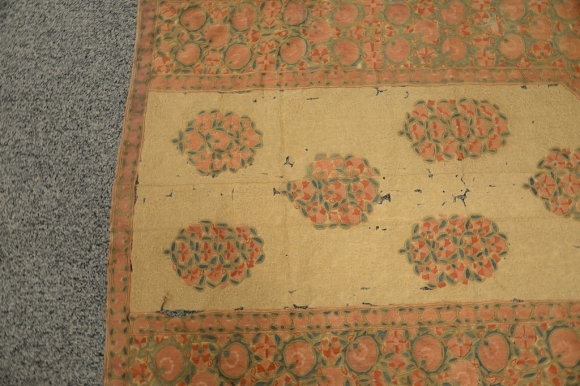 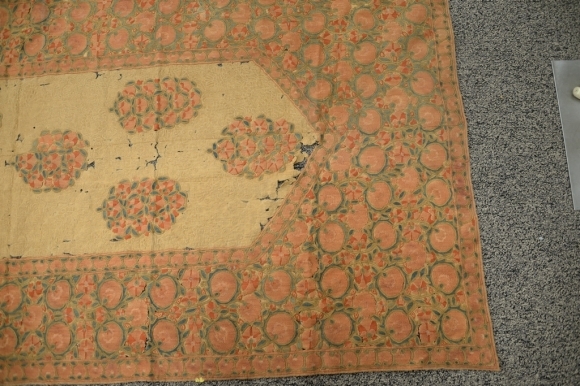 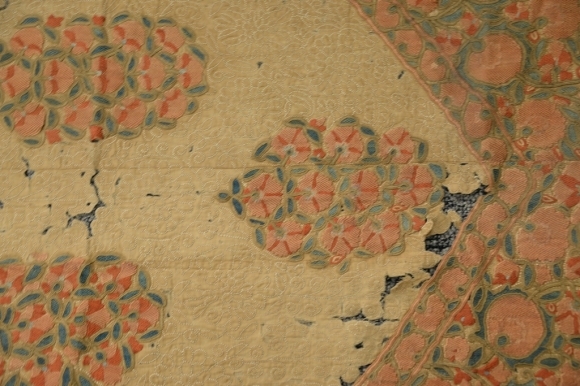 Lot 174 Early textile prayer rug with large borders of fruit, probably 18th century (in some disrepair). 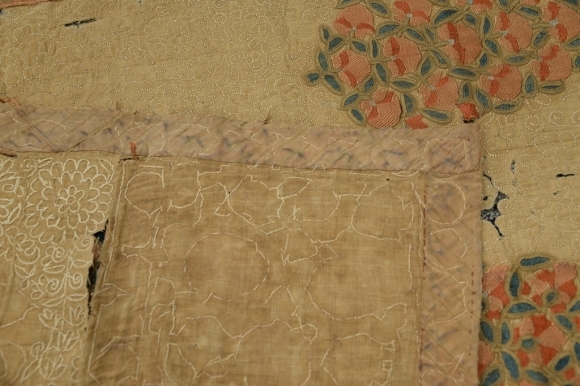 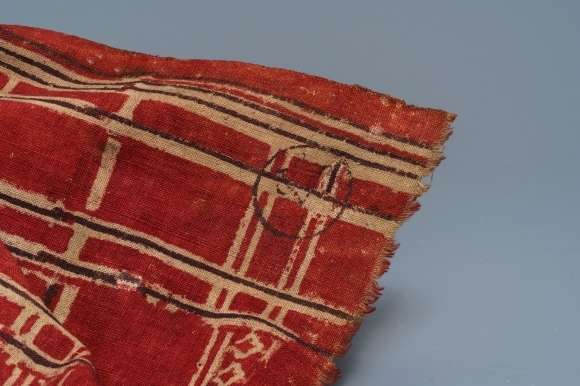 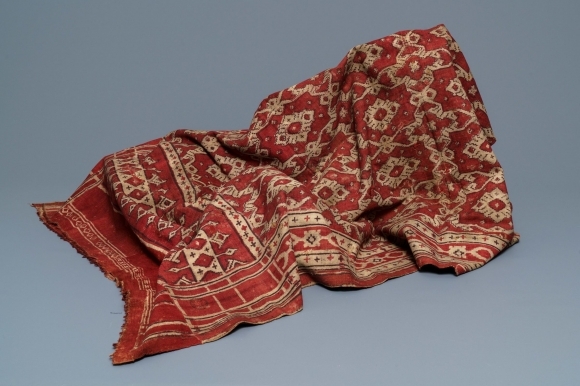 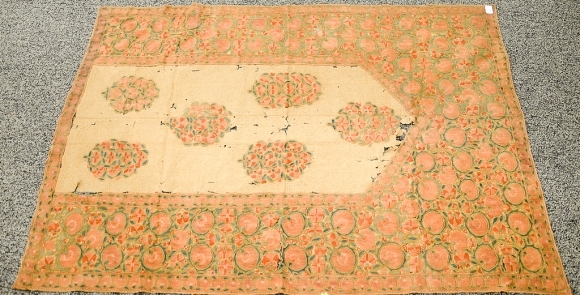 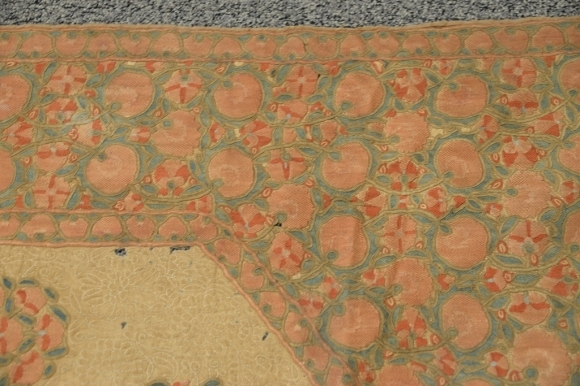 3'4" x 4'9"
Early textile prayer rug with large borders of fruit, probably 18th century (in some disrepair). 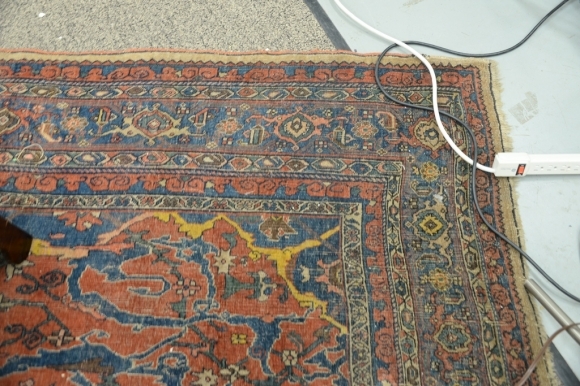 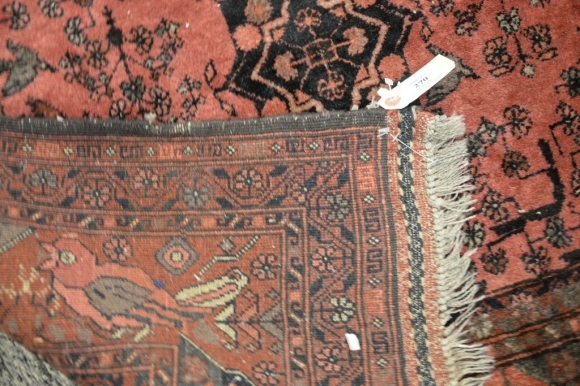 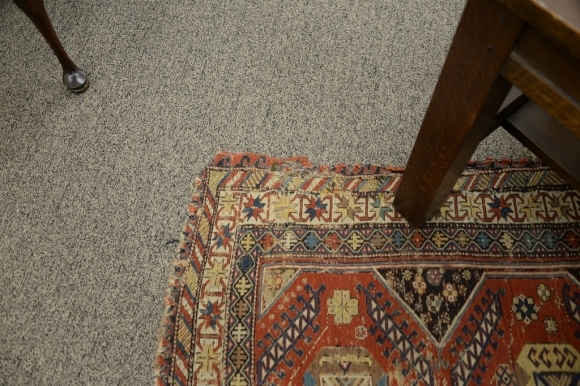 3'4" x 4'9"
Lot 269 Sarouk Oriental carpet (slight wear end fraying). 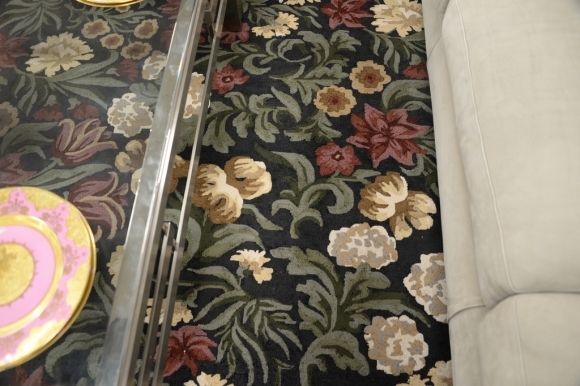 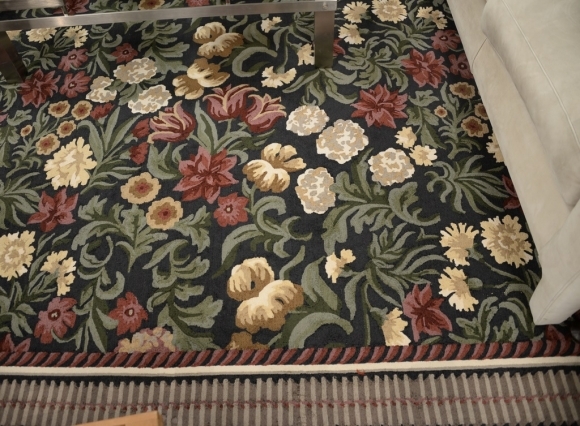 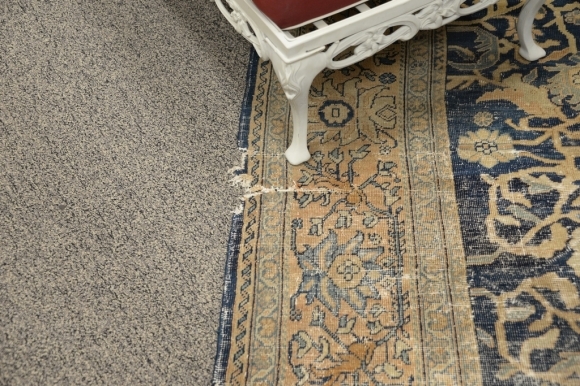 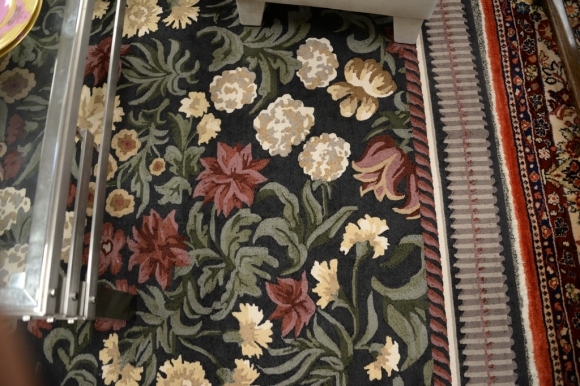 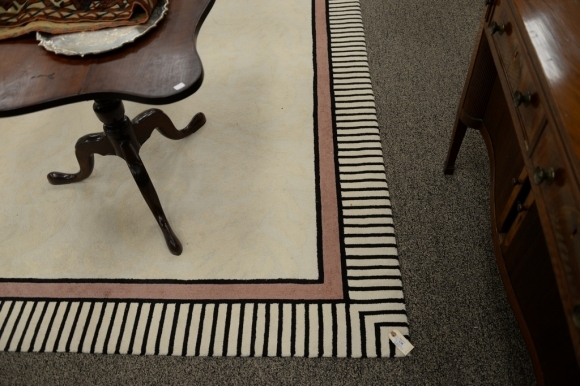 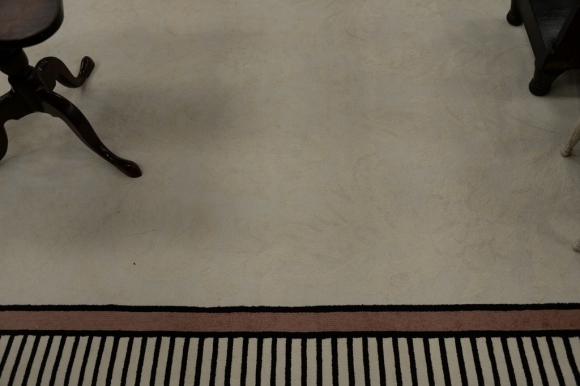 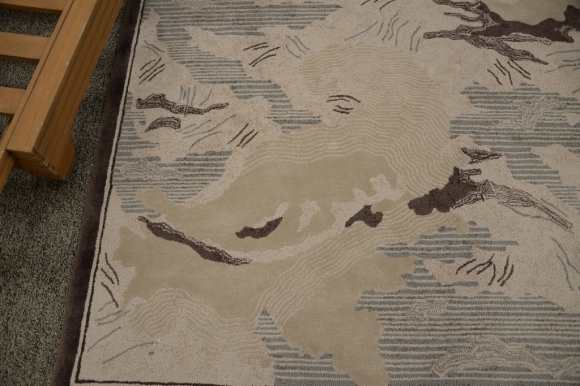 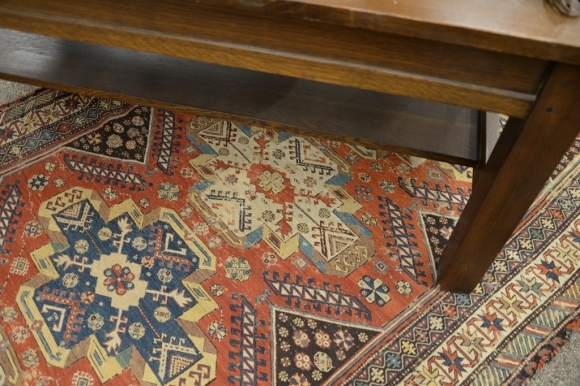 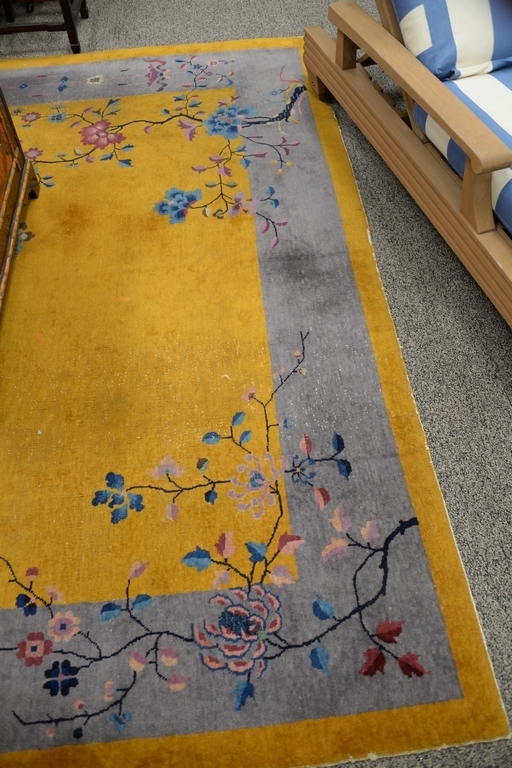 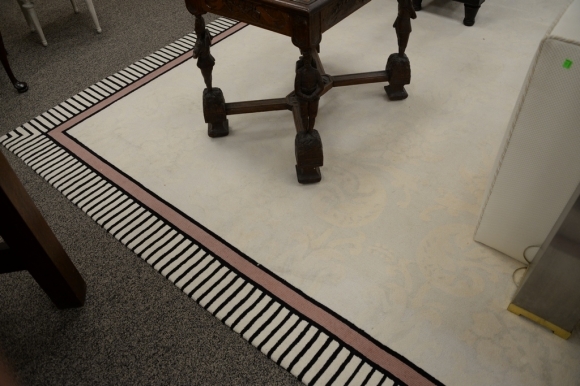 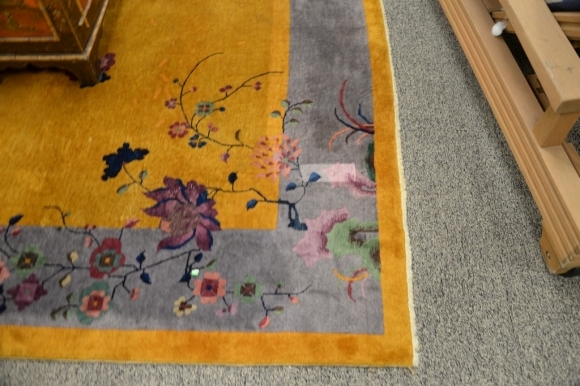 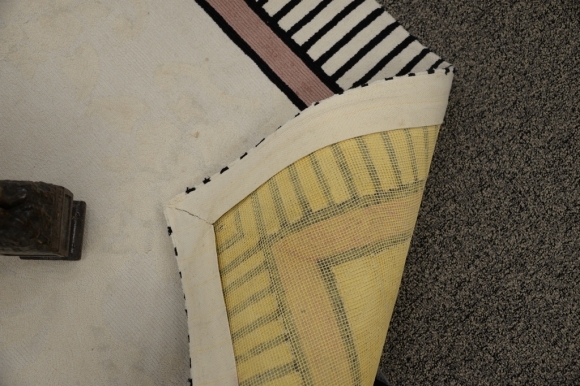 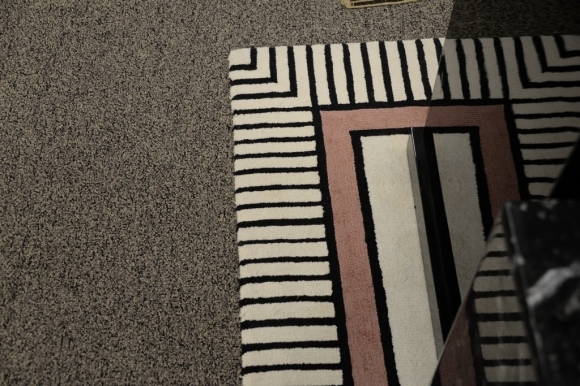 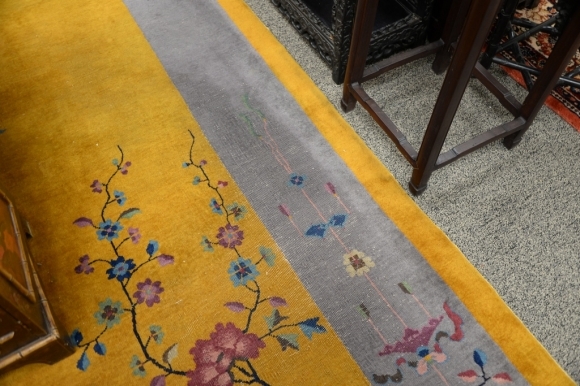 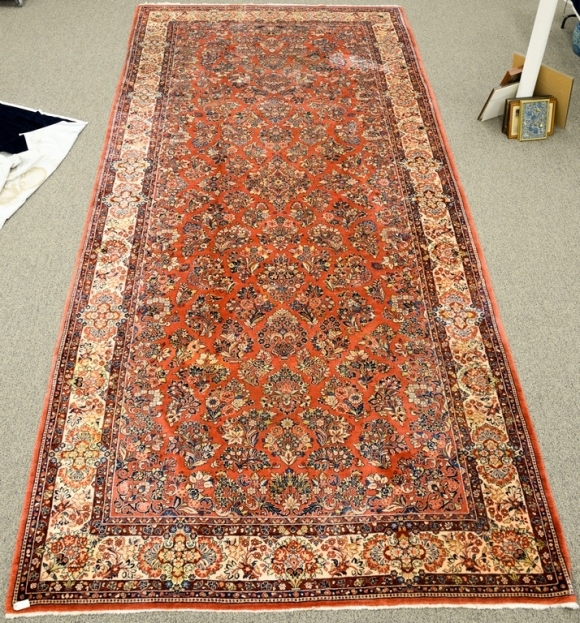 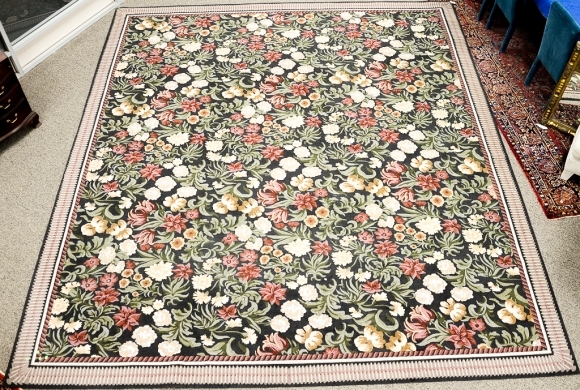 8'10" x 16'8"
Sarouk Oriental carpet (slight wear end fraying). 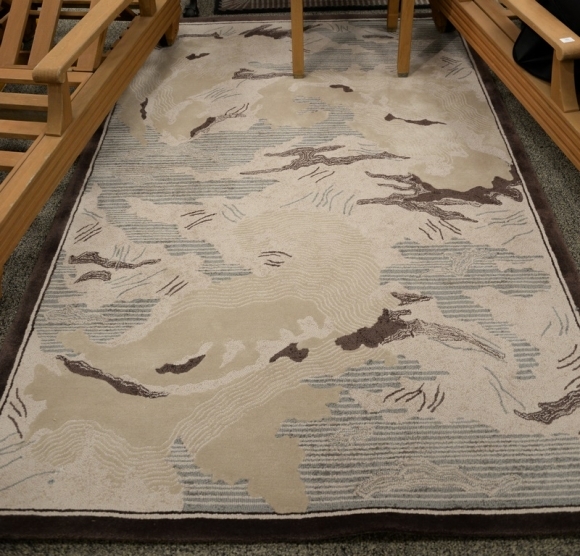 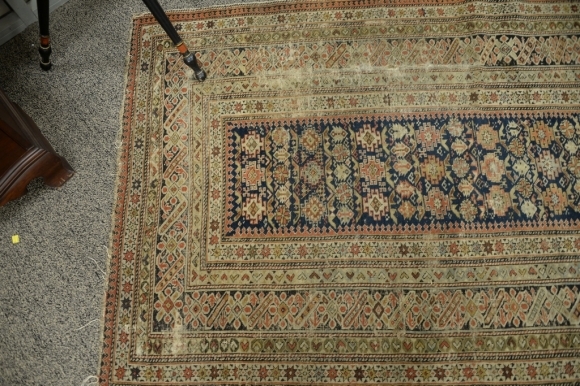 8'10" x 16'8"
Lot 271 Caucasian Oriental throw rug (wear). 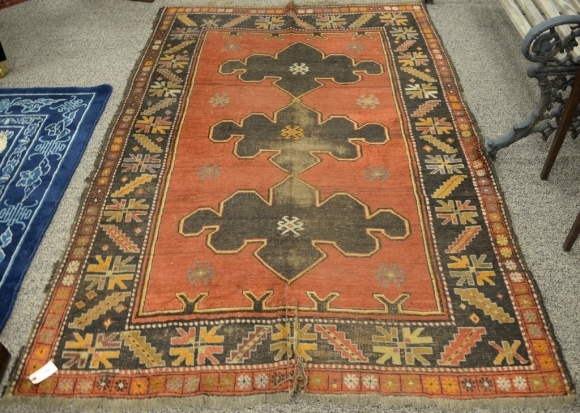 4' x 5'9"
Lot 273 Soumac Oriental area rug, probably 19th century (wear and tears). 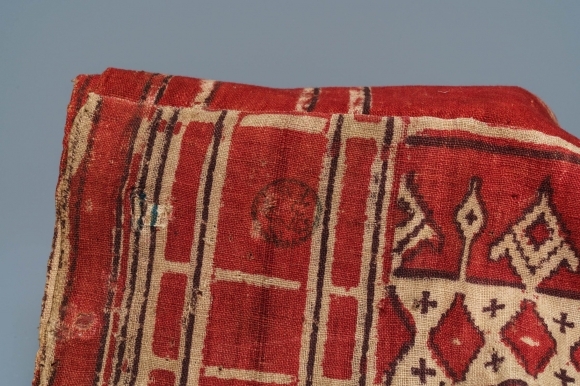 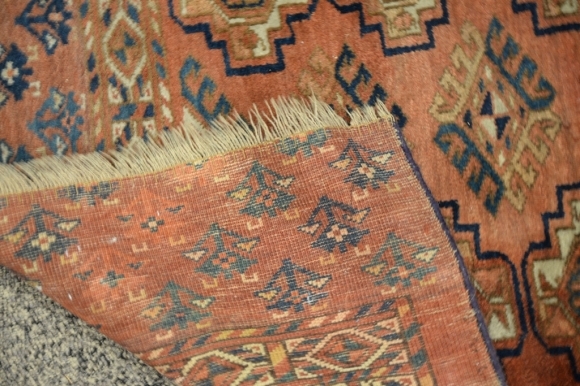 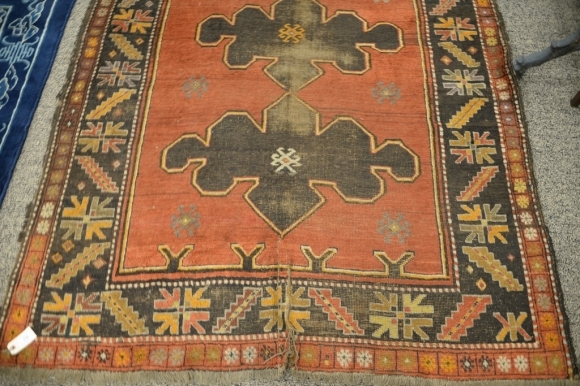 5'9" x 9'2"
Soumac Oriental area rug, probably 19th century (wear and tears). 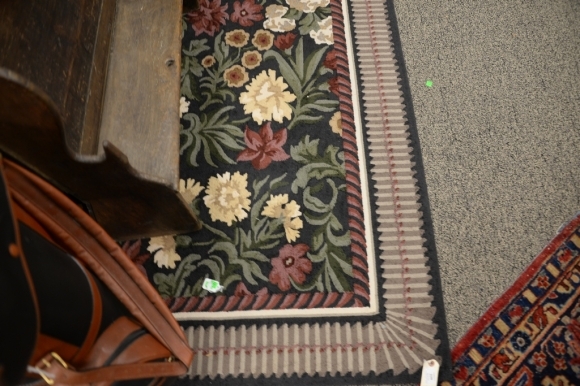 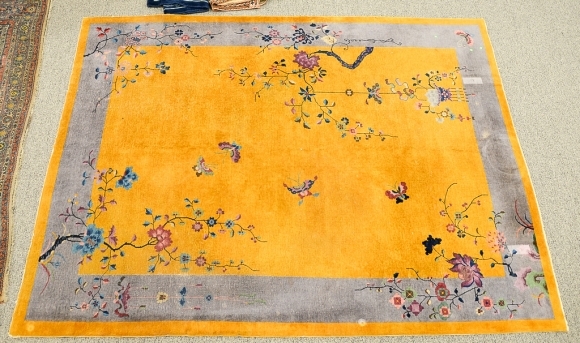 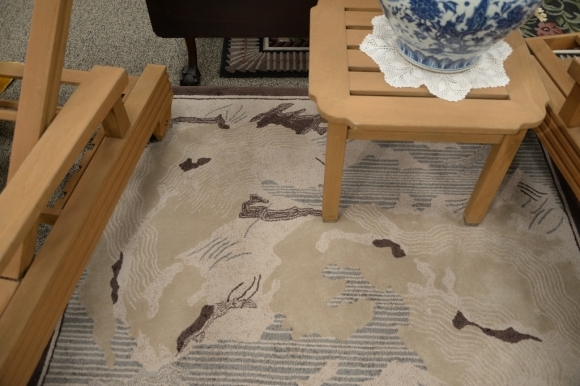 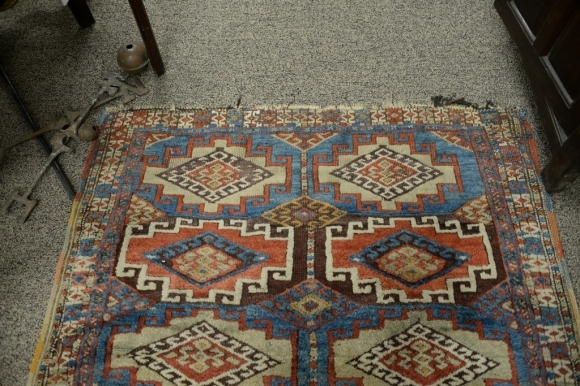 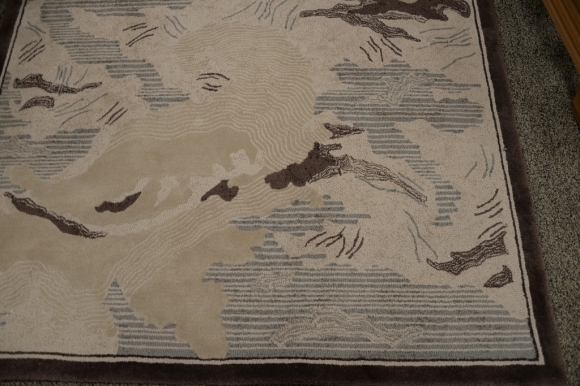 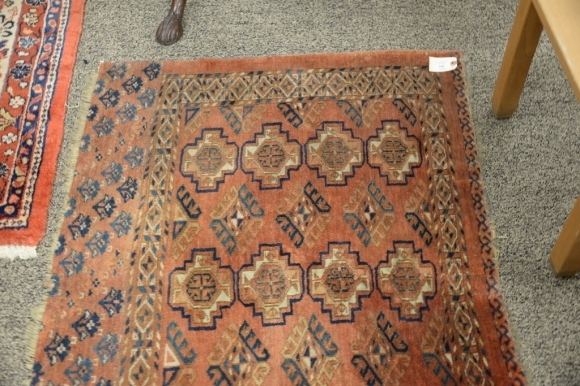 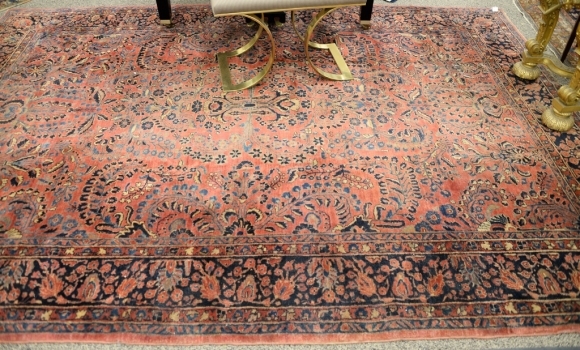 5'9" x 9'2"
Lot 274 Oriental throw rug. 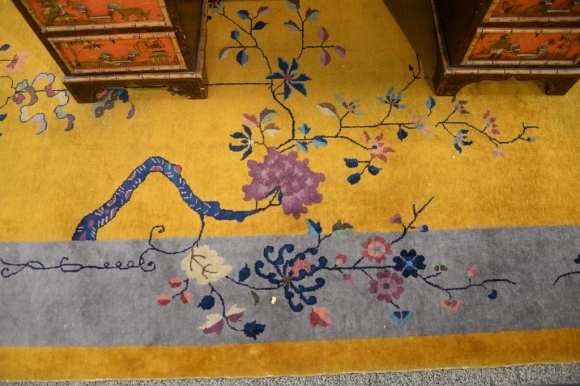 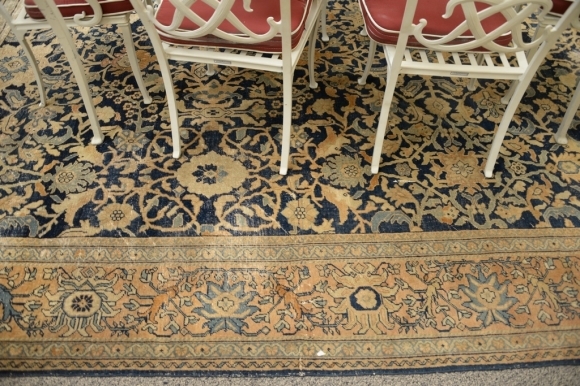 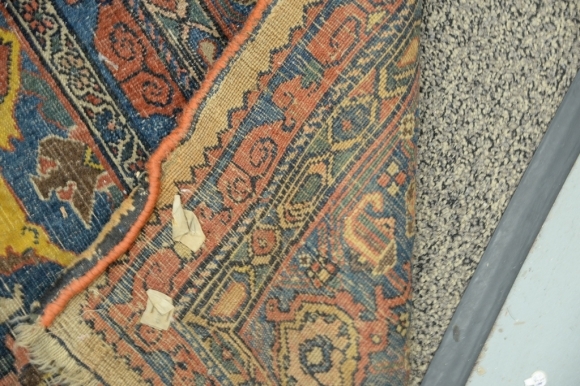 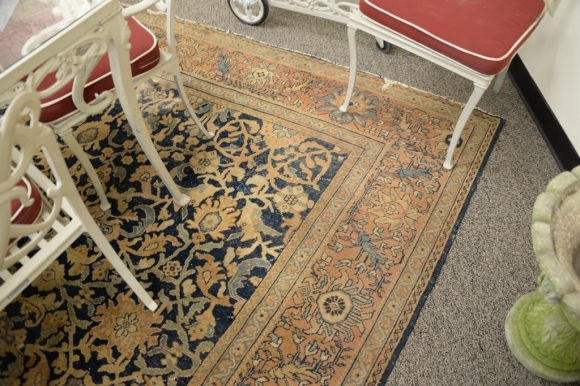 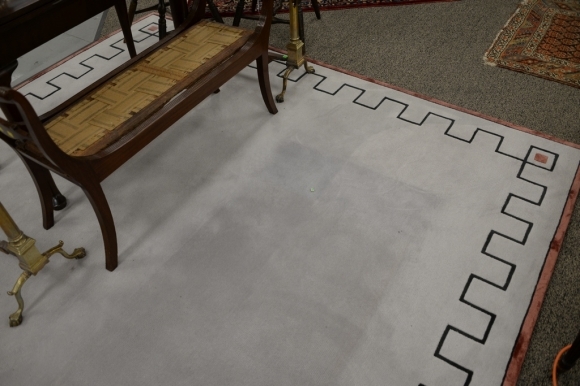 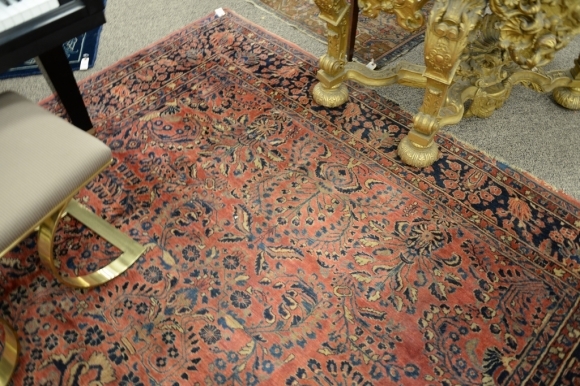 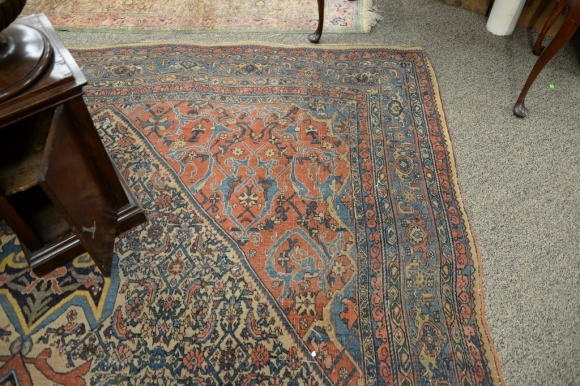 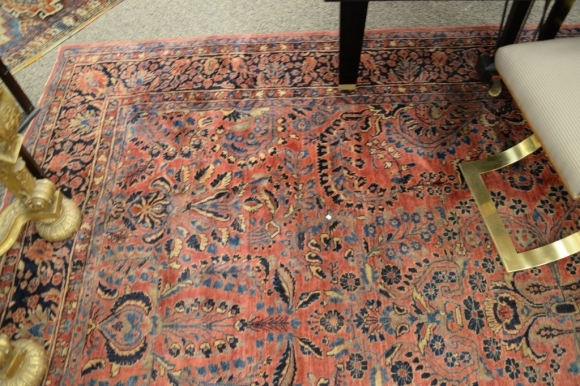 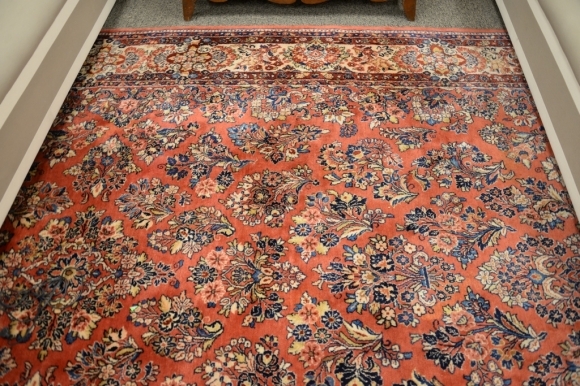 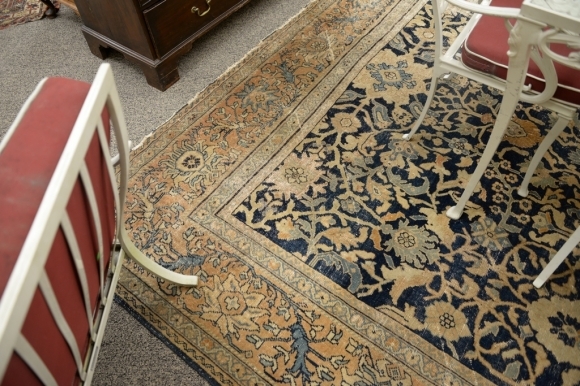 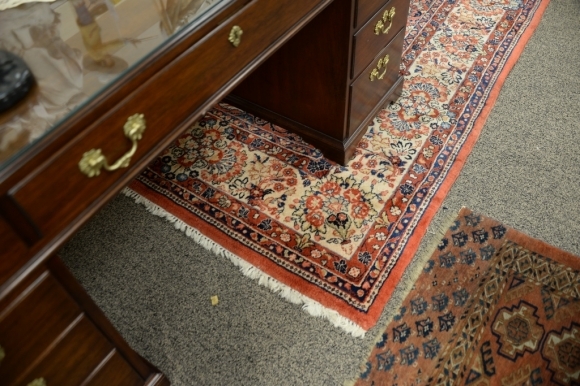 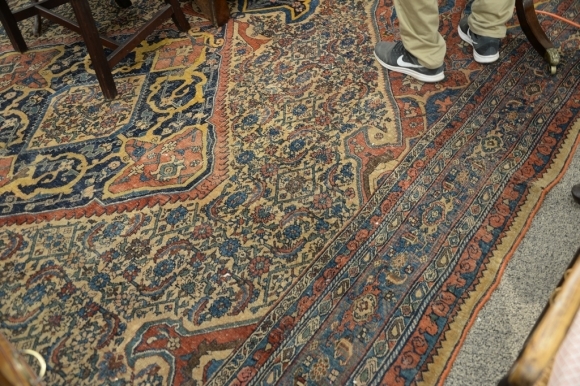 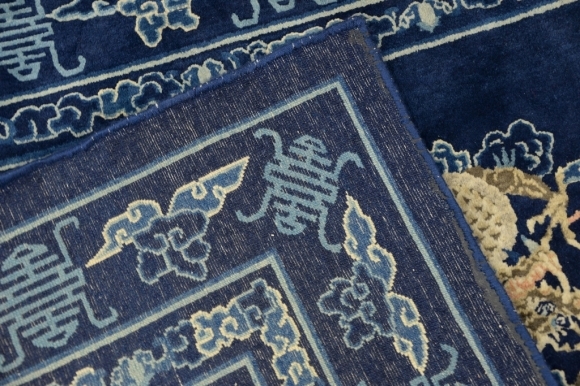 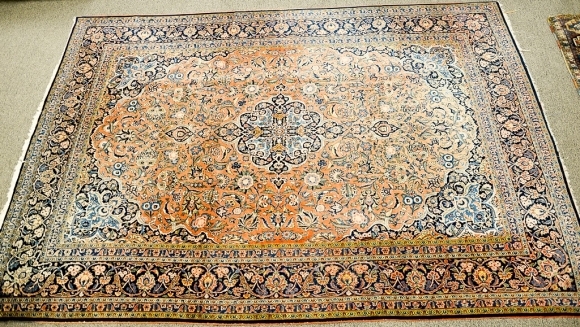 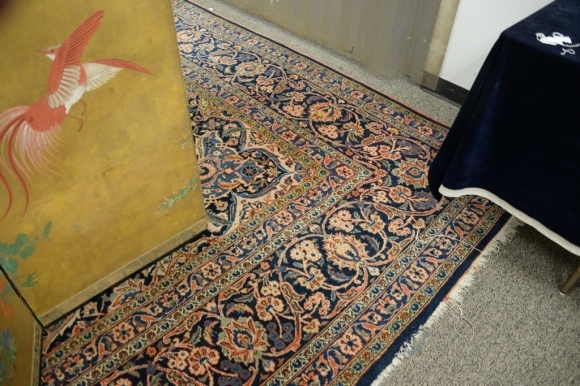 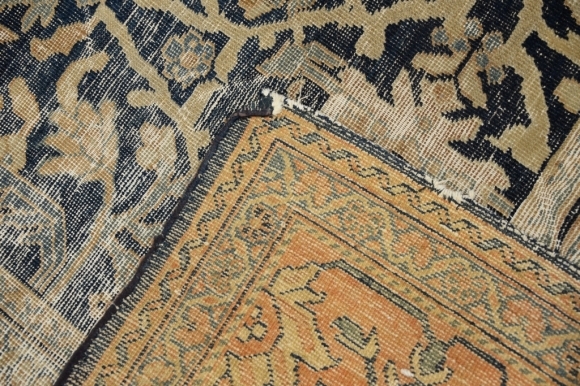 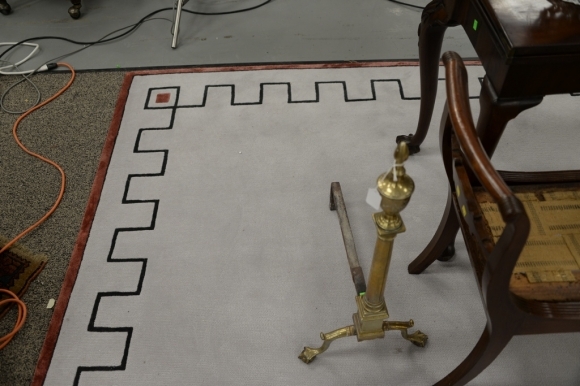 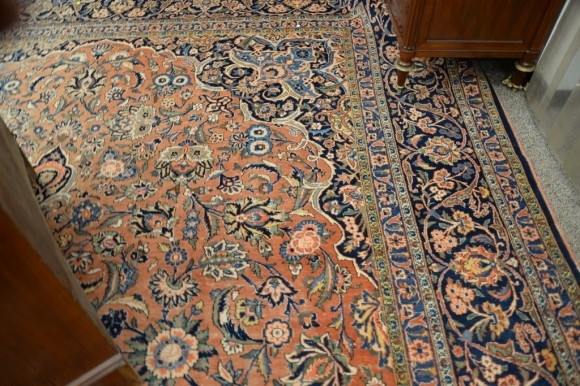 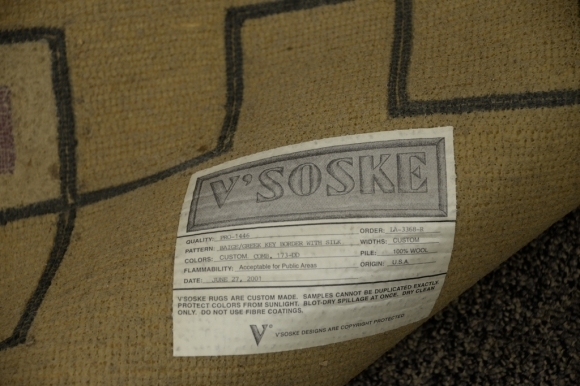 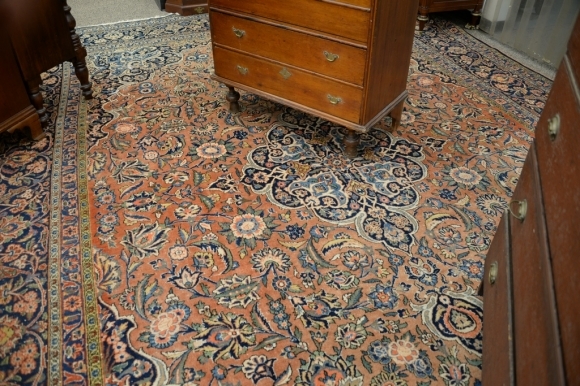 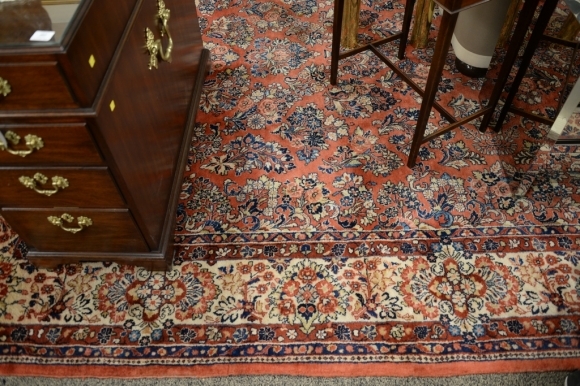 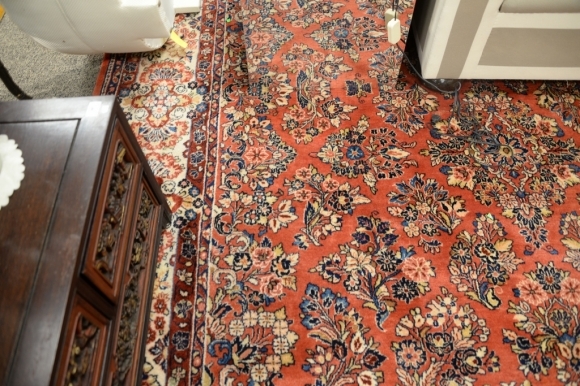 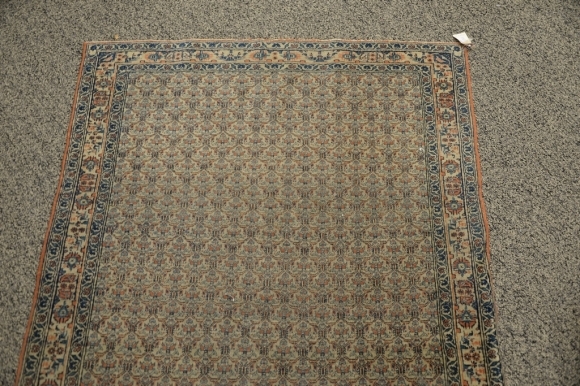 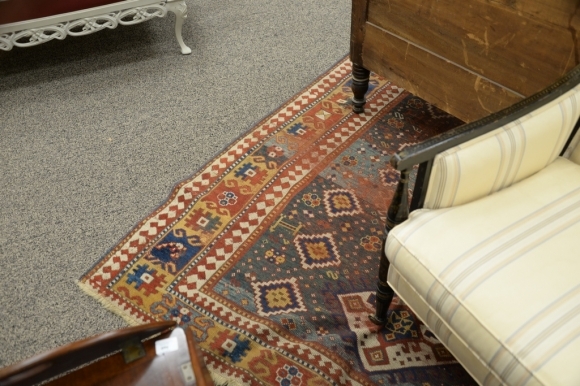 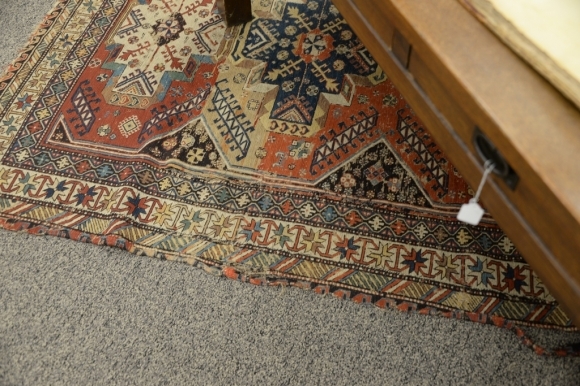 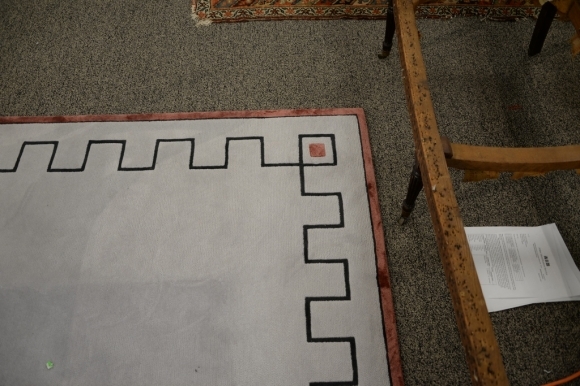 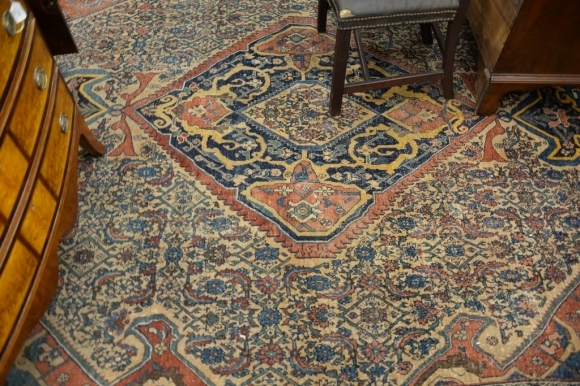 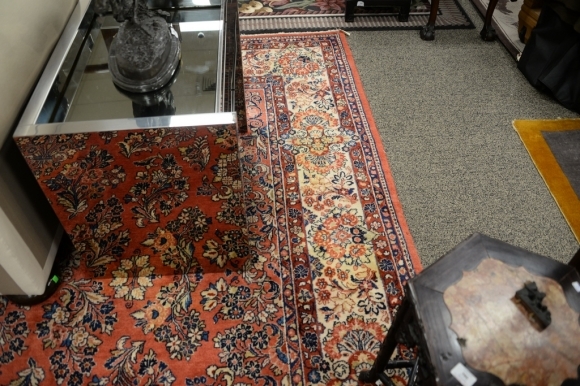 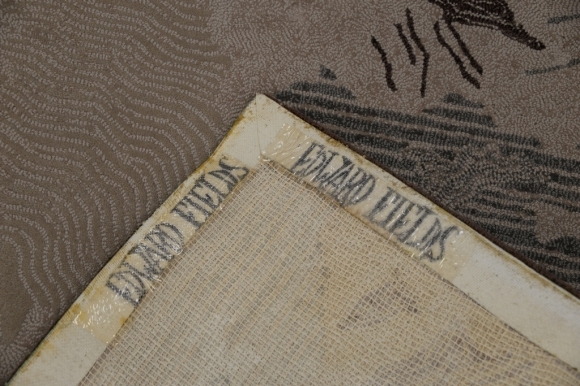 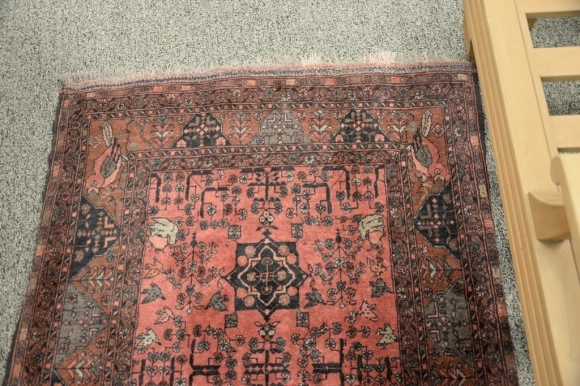 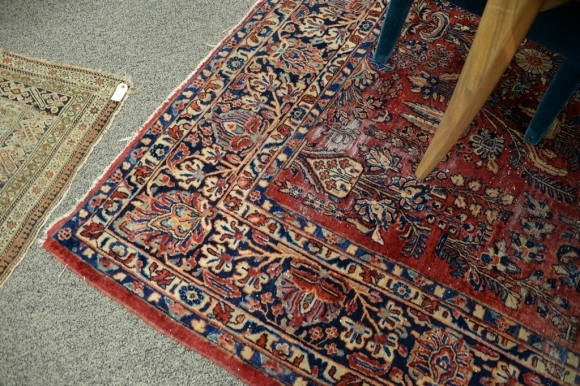 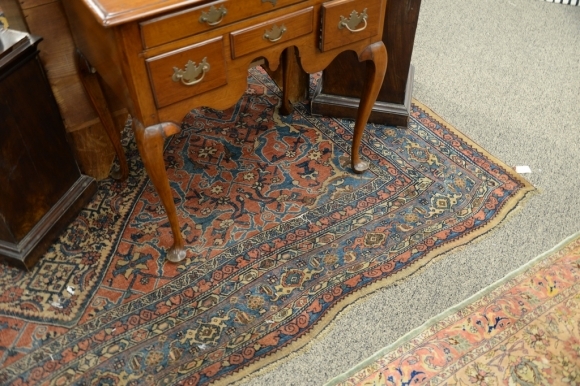 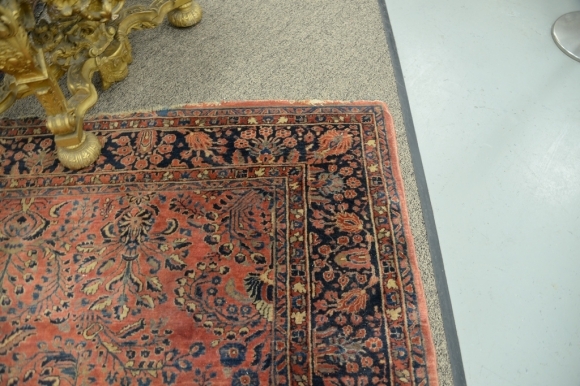 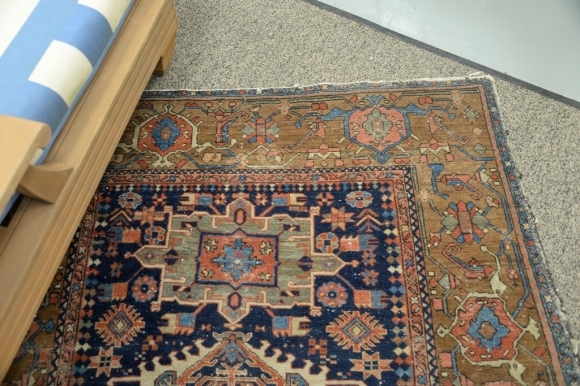 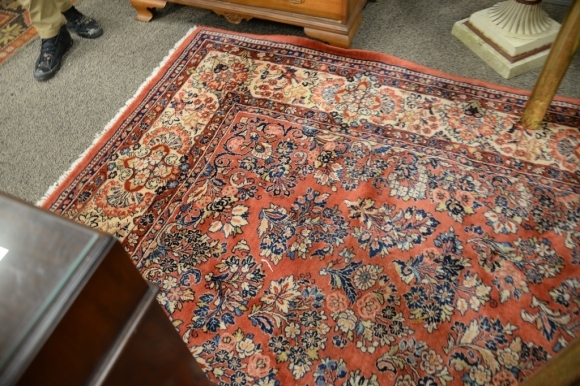 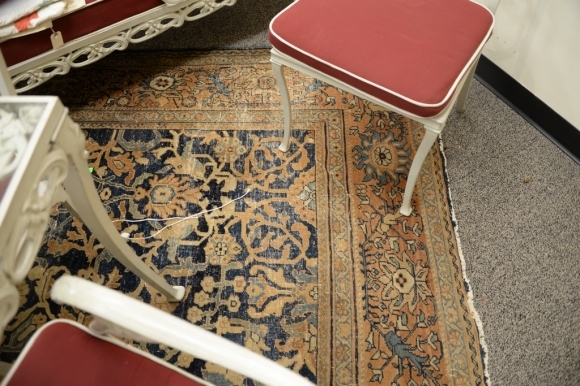 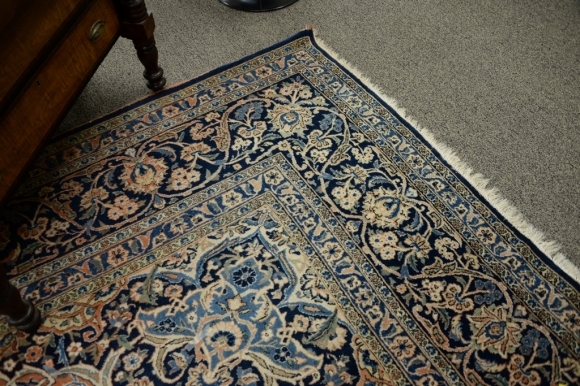 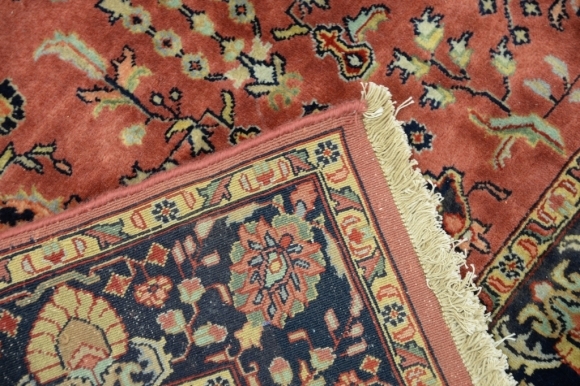 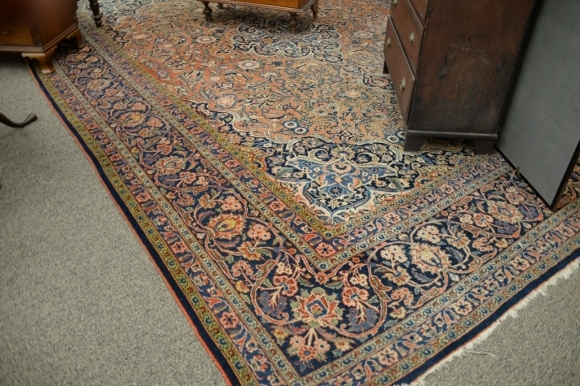 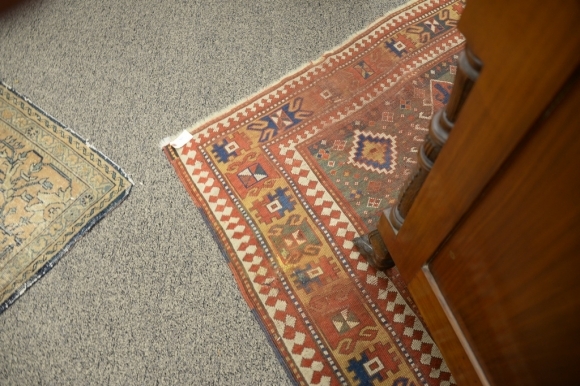 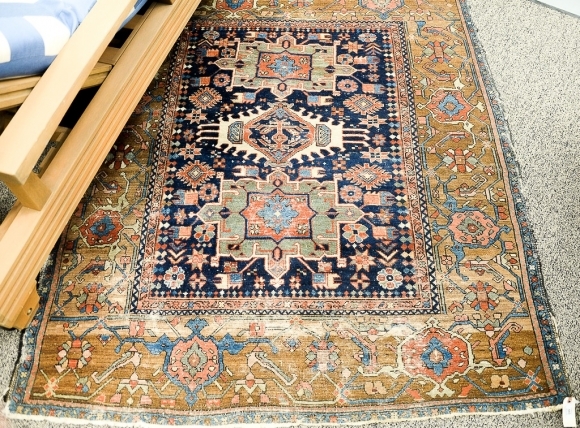 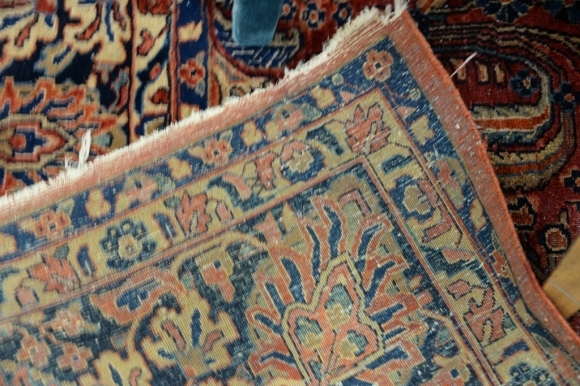 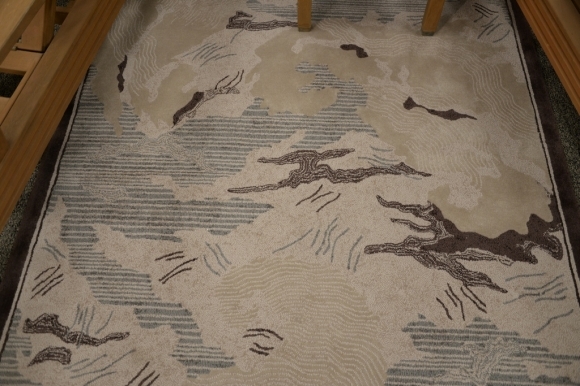 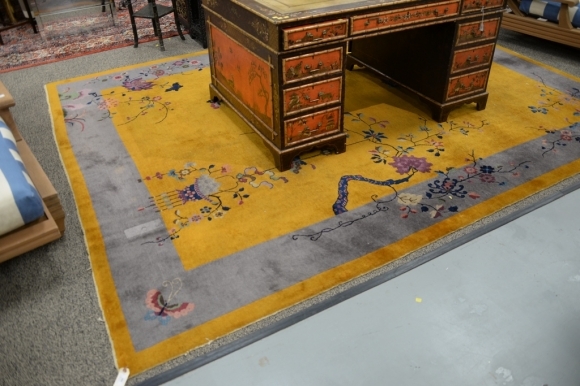 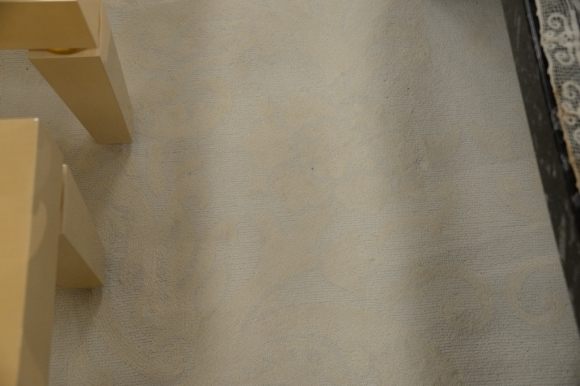 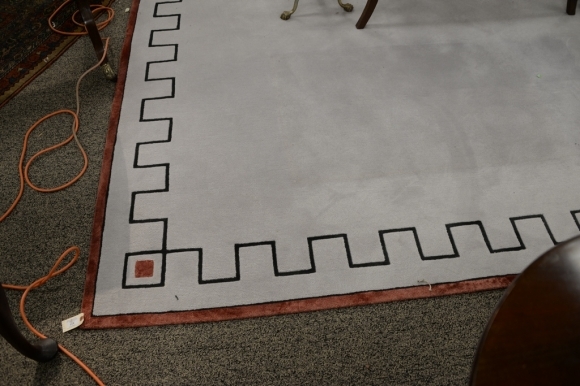 4'3" x 6'4"
Lot 276 Room size Sarouk Oriental carpet (discoloration). 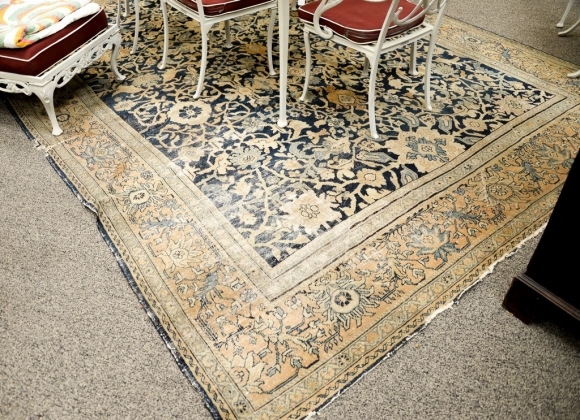 12' x 16'10"
Room size Sarouk Oriental carpet (discoloration). 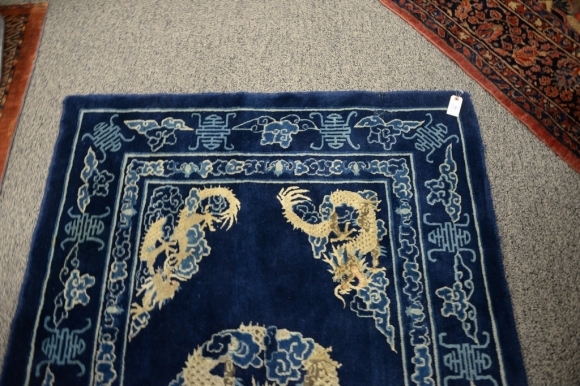 12' x 16'10"
Lot 389 Chinese Oriental carpet (some wear). 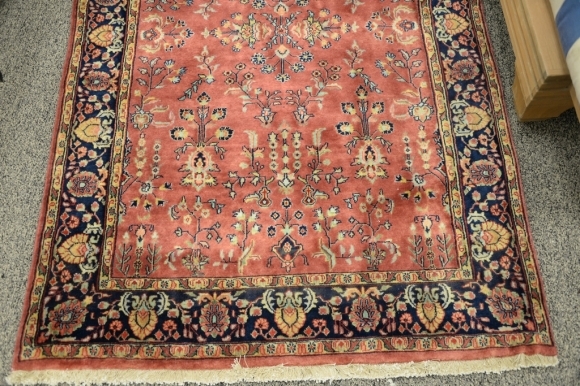 9' x 11'8"
Lot 391 Sarouk Oriental carpet (end fraying). 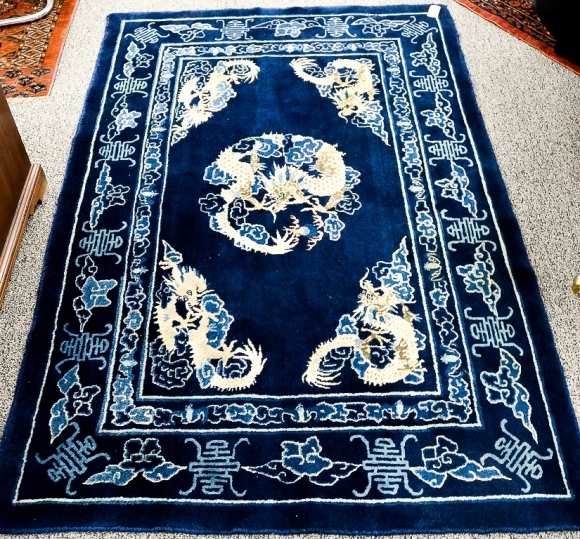 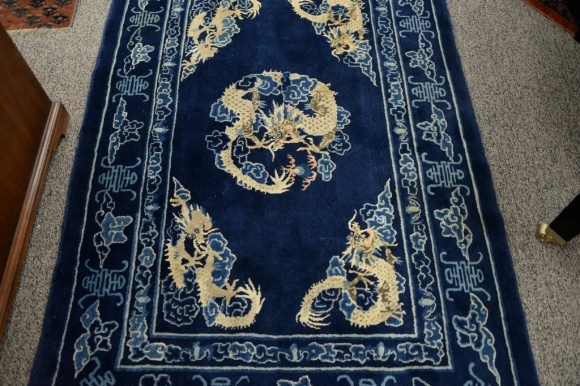 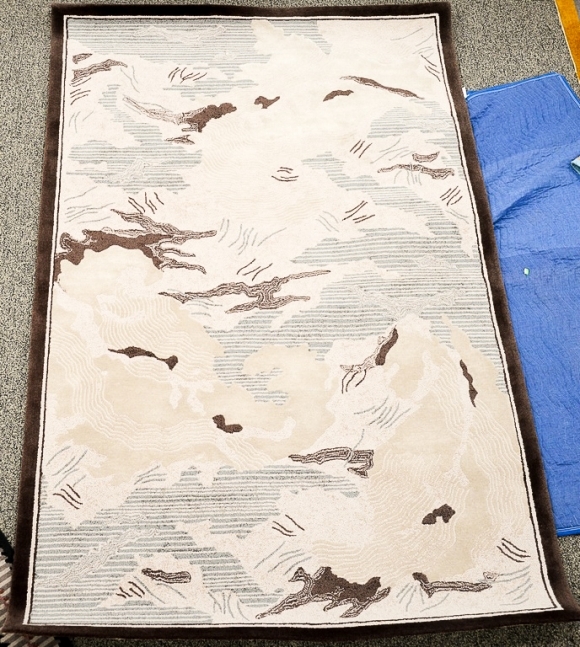 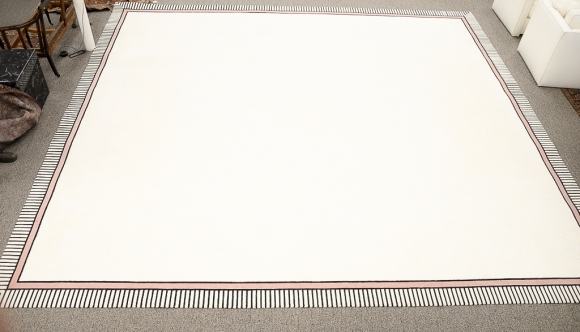 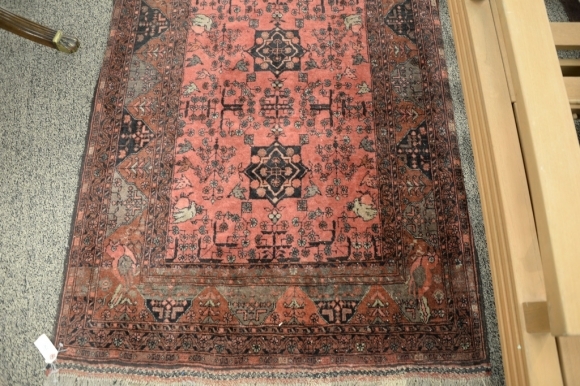 8' x 11'3"
Lot 392 Oriental throw rug (wear). 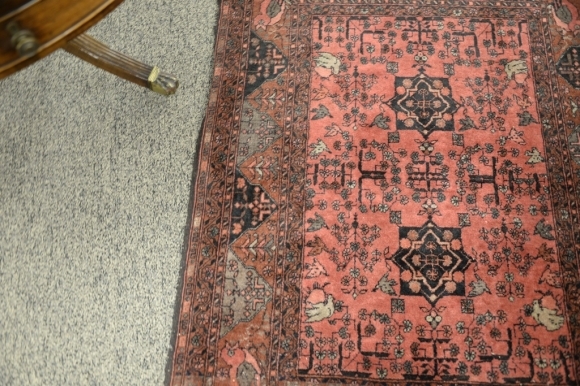 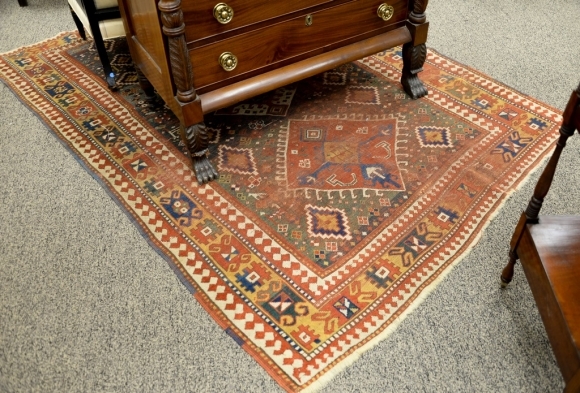 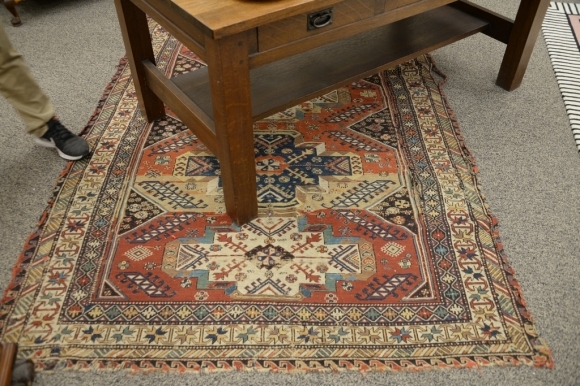 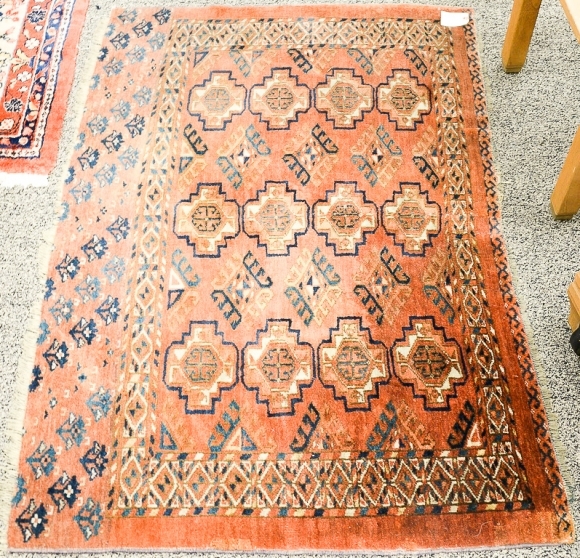 4'8" x 5'8"
Lot 393 Bokhara Oriental throw rug. 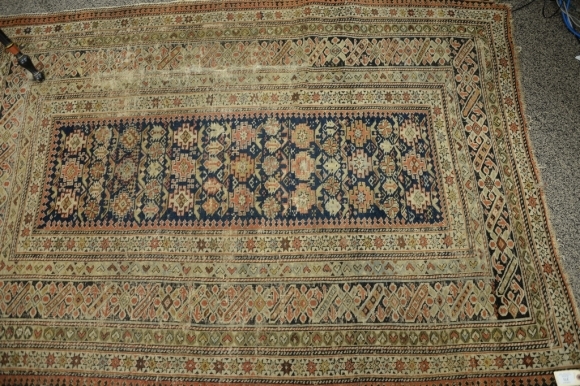 3' x 4'3"
Lot 479 Caucasian Oriental throw rug. 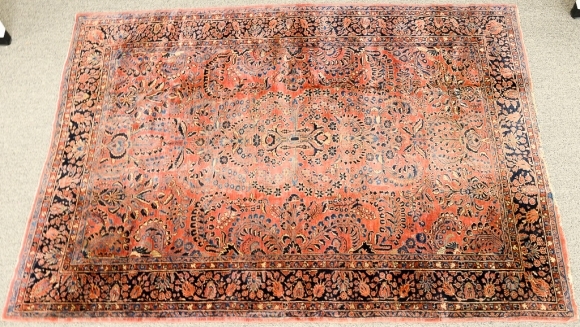 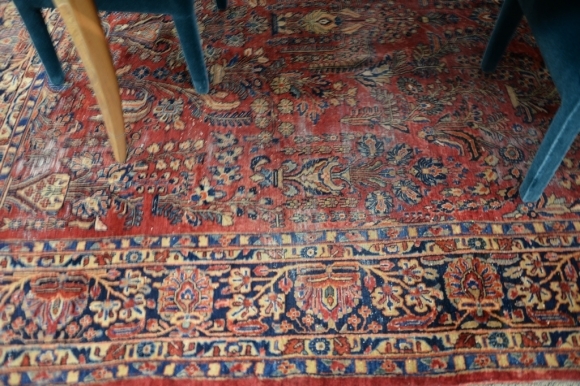 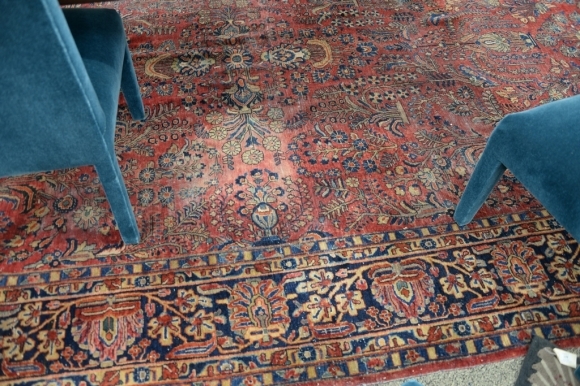 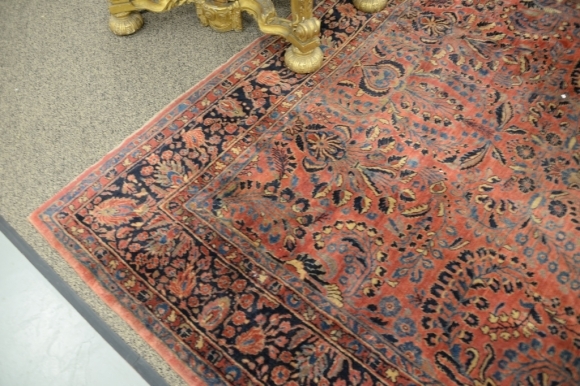 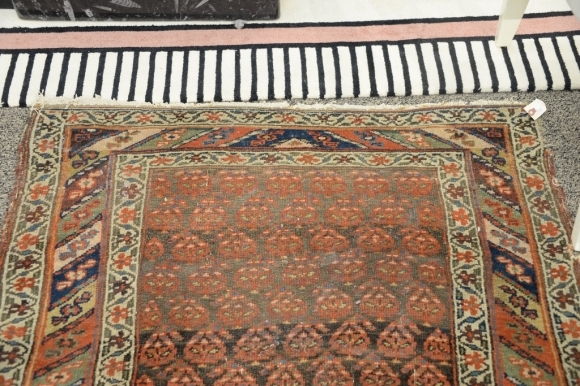 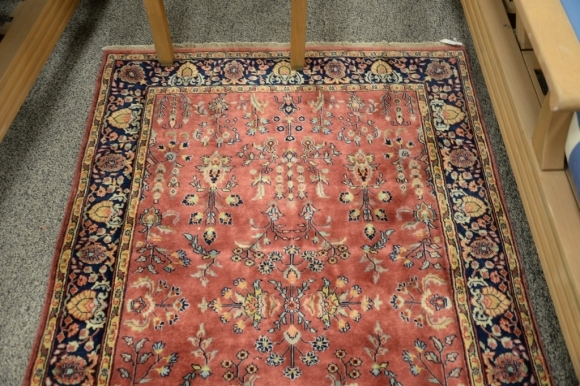 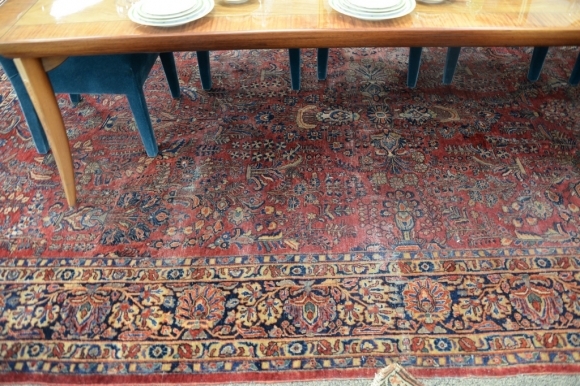 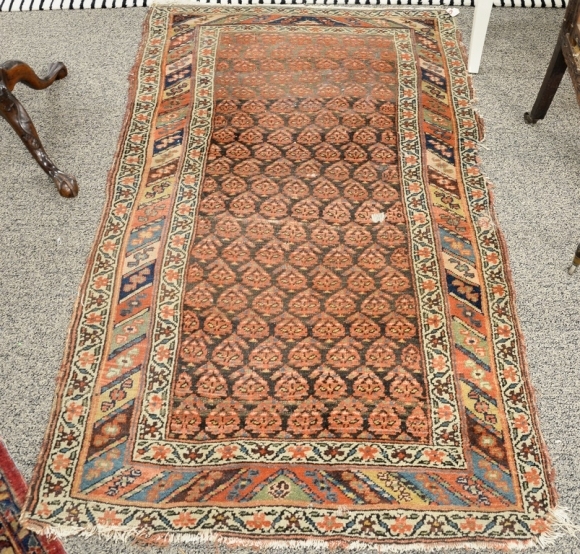 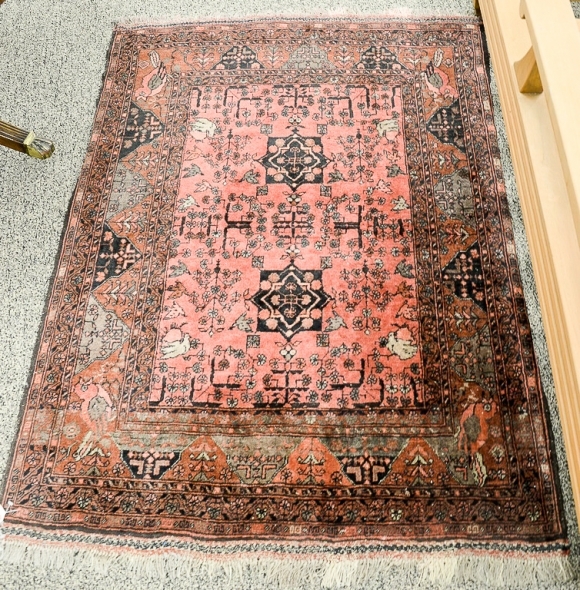 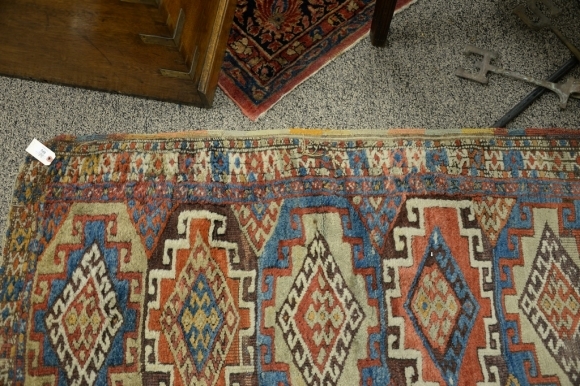 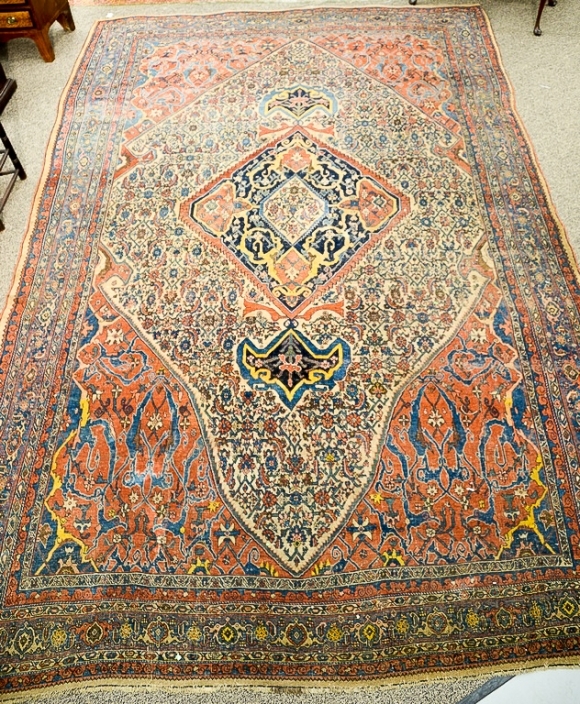 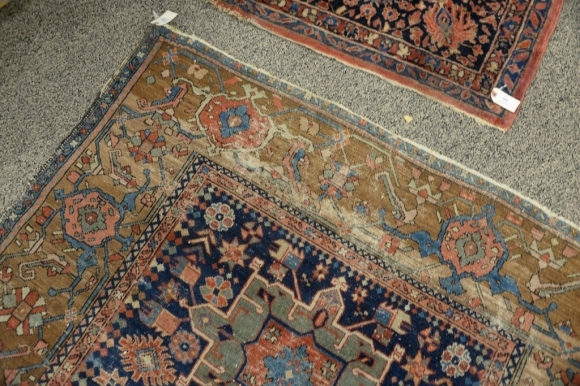 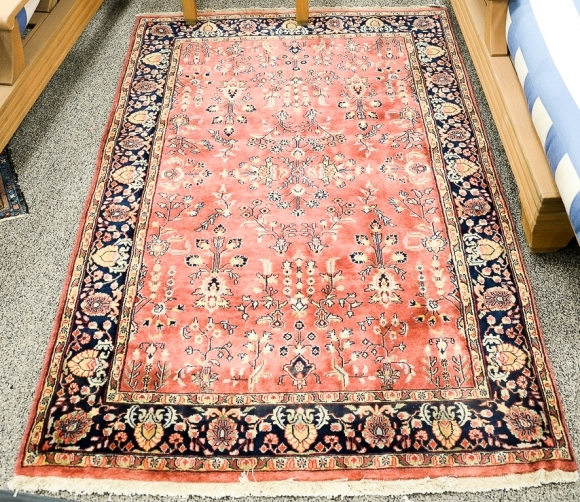 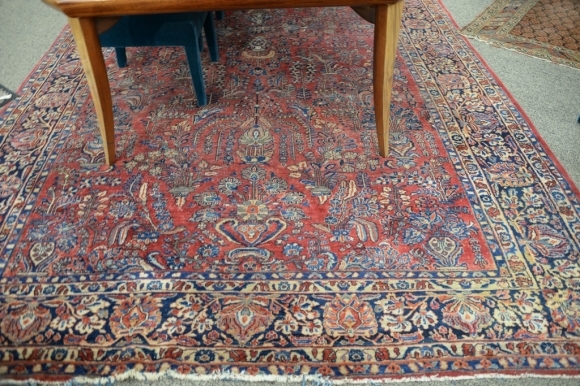 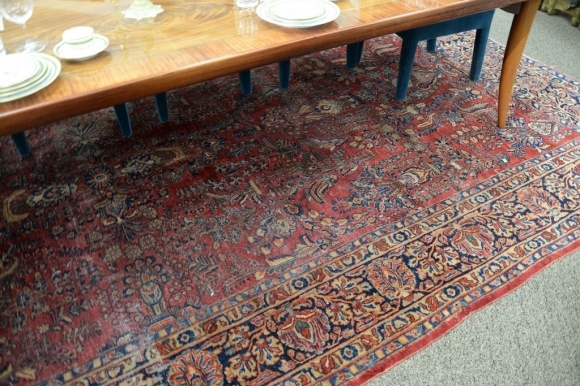 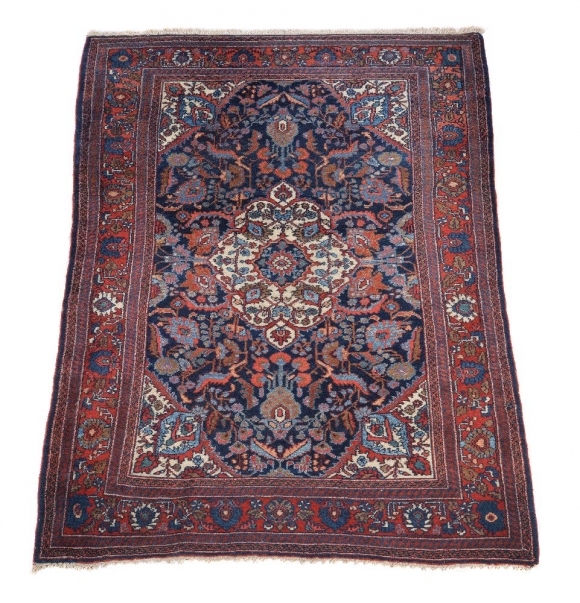 3'7" x 6'2"
Lot 547 Sarouk Oriental carpet. 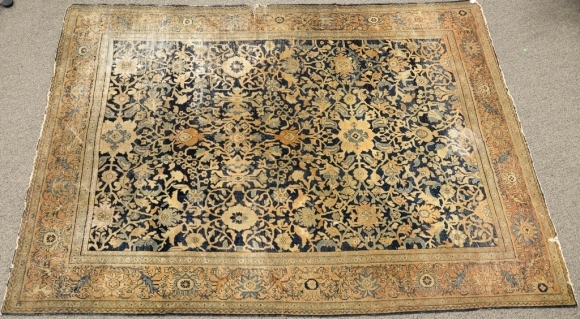 9'6" x 20'5"
Lot 549 Caucasian Oriental throw rug, late 19th century (end fraying). 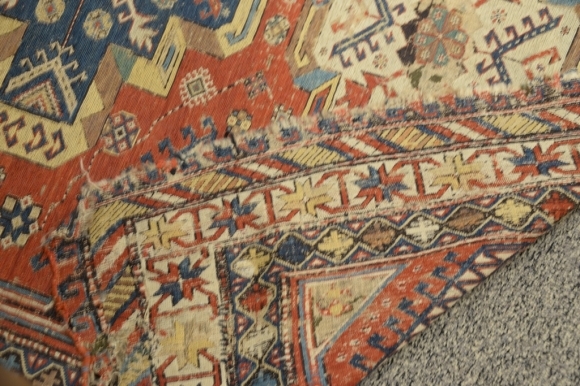 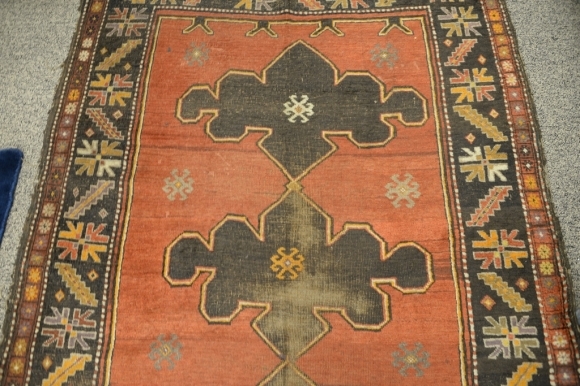 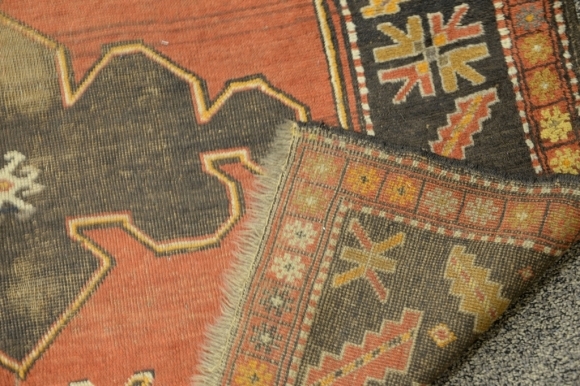 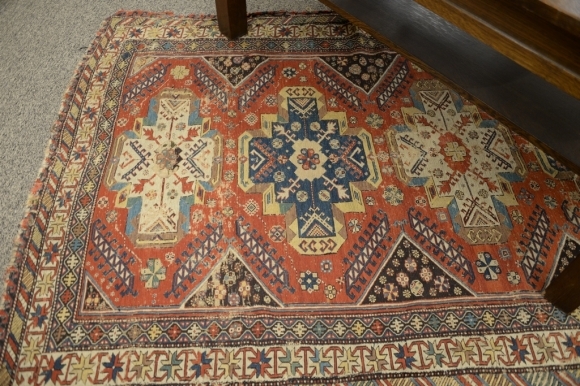 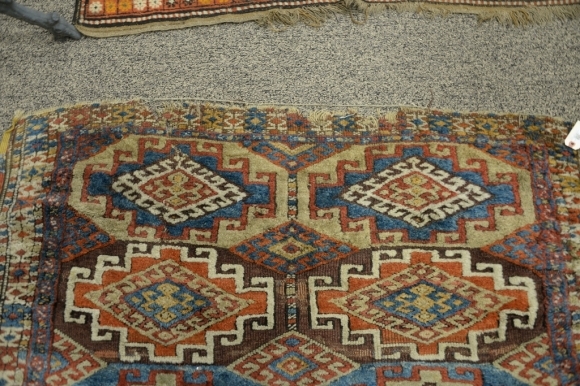 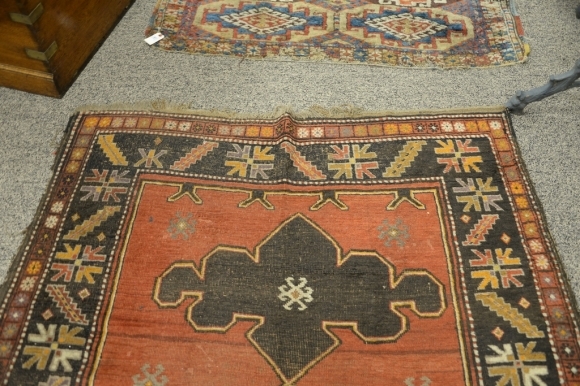 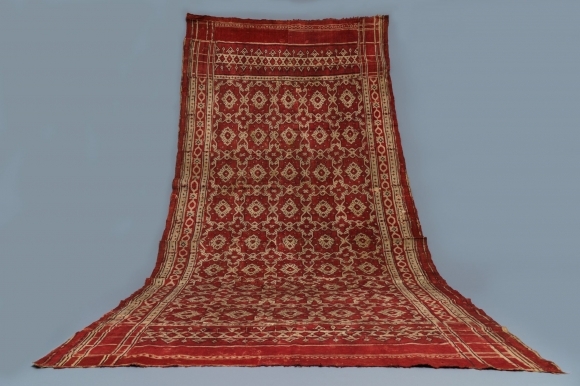 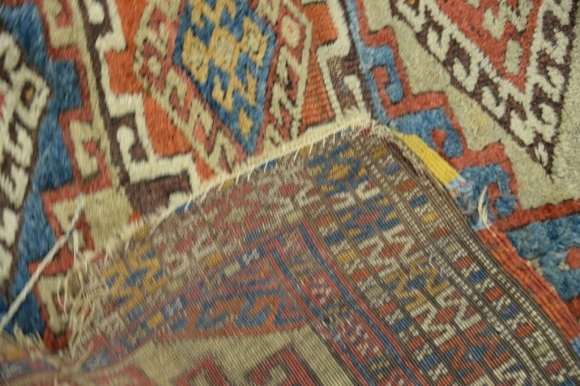 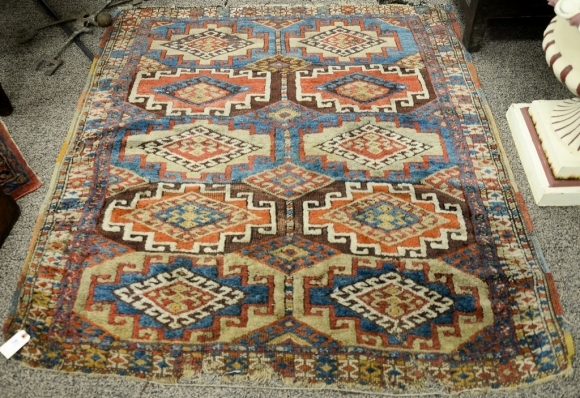 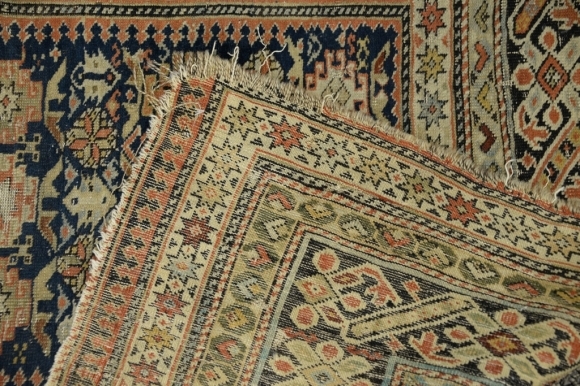 4'3" x 4'9"
Caucasian Oriental throw rug, late 19th century (end fraying). 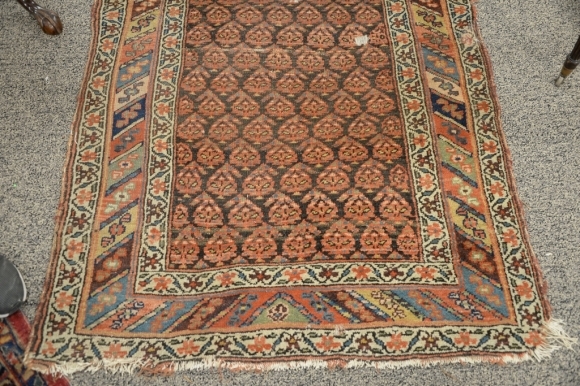 4'3" x 4'9"
Lot 564 Oushak Oriental carpet (worn, 6 in. 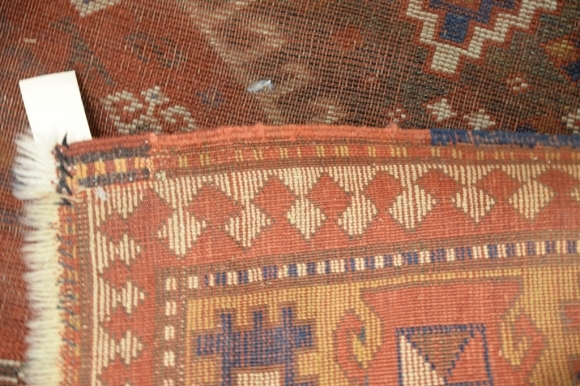 tear at border). 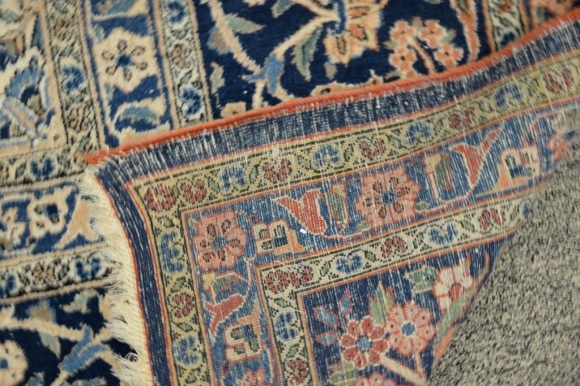 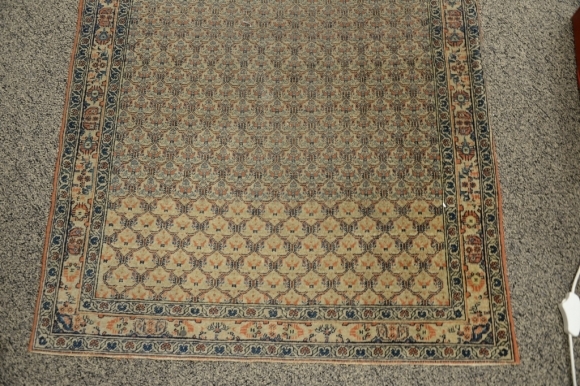 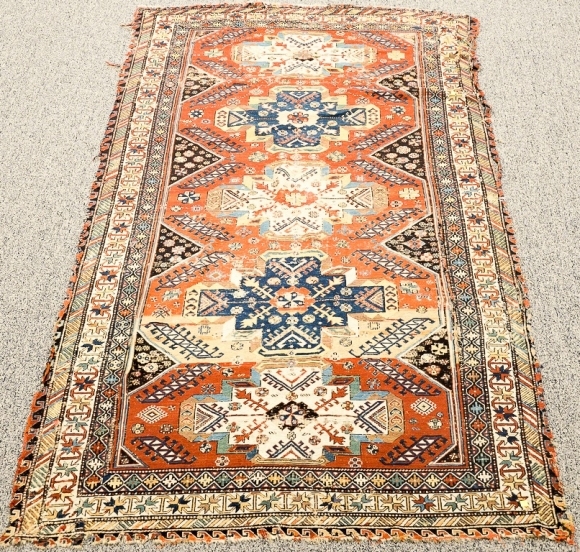 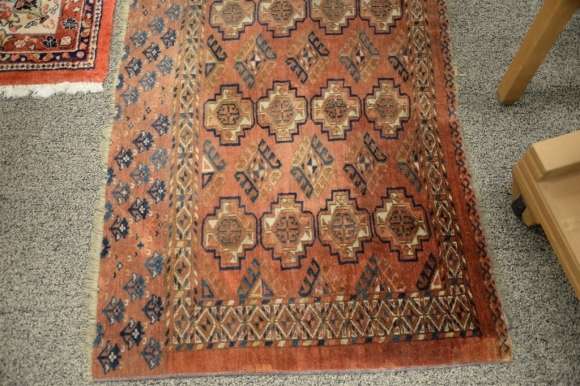 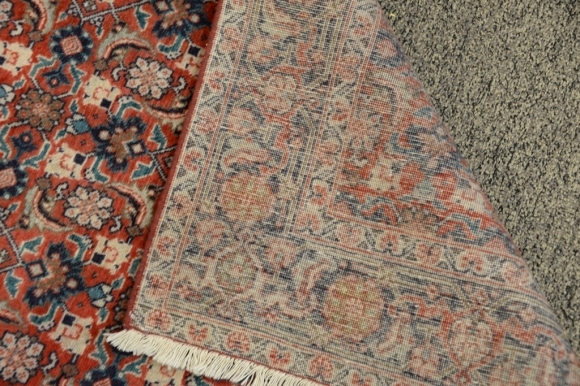 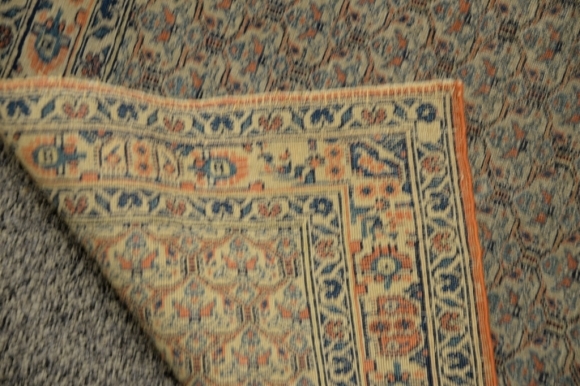 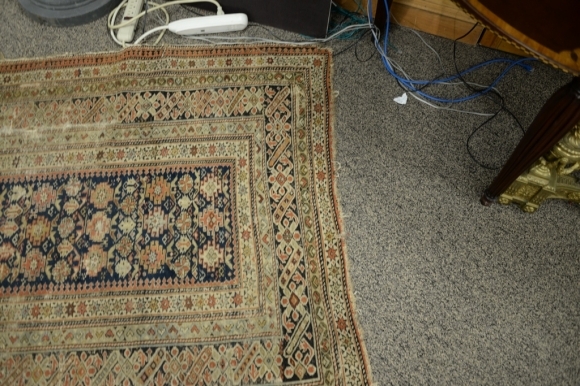 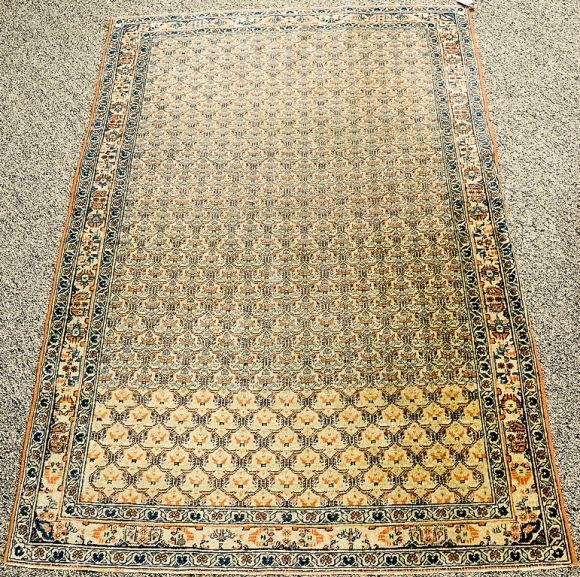 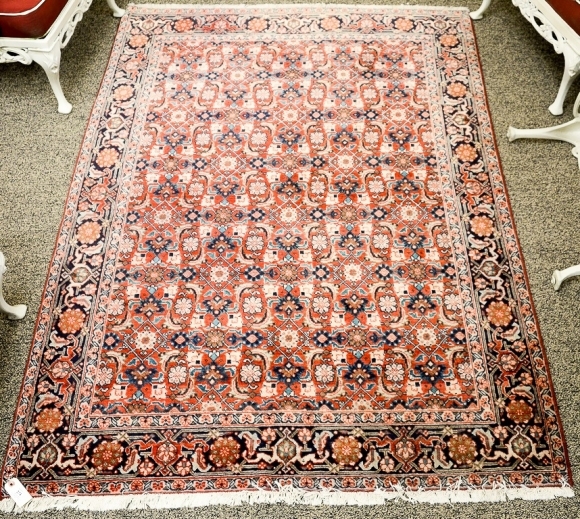 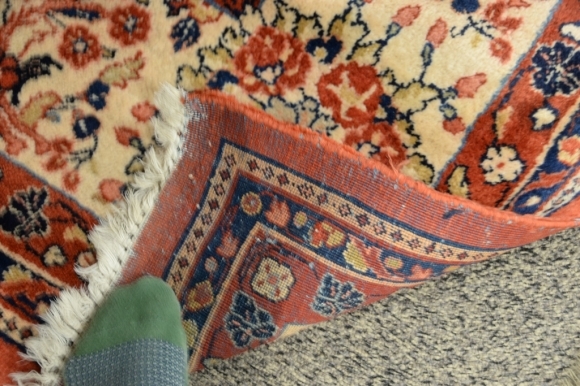 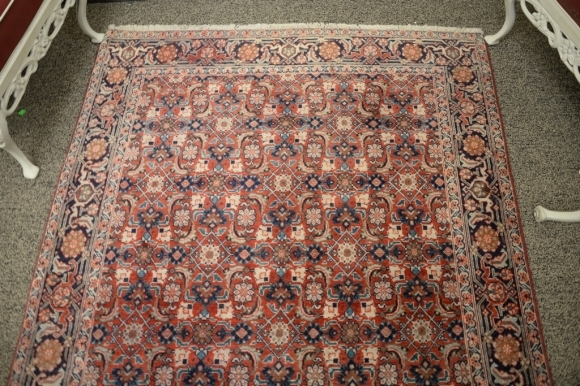 9' x 12'6"
Oushak Oriental carpet (worn, 6 in. 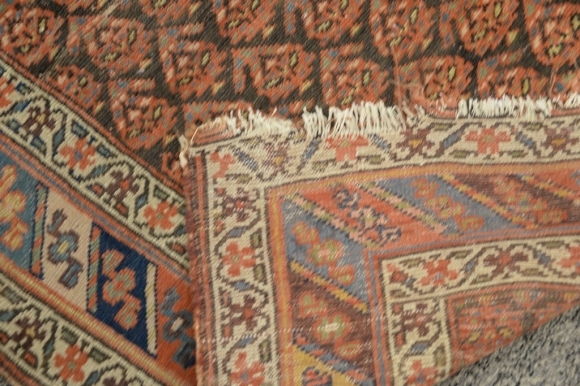 tear at border). 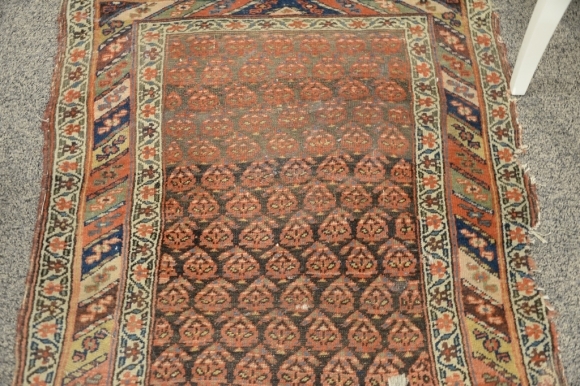 9' x 12'6"